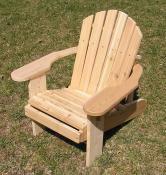 The Kid's Rocker is a smaller replica of our adult Adirondack rocker. Toddlers and children to age 7 will have fun indoors and outdoors with furniture built for them. These will be cherished family heirlooms. The perfect indoor/outdoor bench for kids. Ideal for video games, Saturday morning cartoon watching -- or just playing house.��Seats two. Ideal for indoor or outdoor use.��Constructed of Western Red Cedar, stainless steel screws and waterproof glue, it will become a heirloom. The See Saw/Teeter Totter is perfect for the whole family. Easily adjustable for all sizes;��kids and adults can have great fun for hours.